On 30 April 2017, i.e. 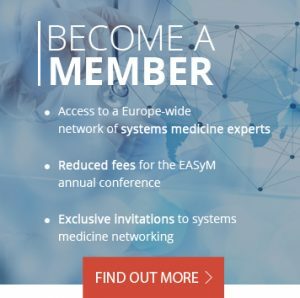 the official end date of the Coordinating Action Systems Medicine (CASyM), Prof Dr Anna Norrby Teglund (EASyM Treasurer) and Prof Dr Mikael Benson (responsible for International Projects and Funding) officially resigned from the EASyM Executive Board due to an increasing workload and multiple commitments. Prof Dr Norrby Teglund and Prof Dr Benson, who both remain individual members of EASyM, were warmly thanked by the Executive Board for their work. The Executive Board appointed Mr David Supple, the then Vice Treasurer of EASyM, to the role of Treasurer from 1st May 2017 on. In order to fill the then vacant position of Vice Treasurer, the Executive Board appointed Prof Dr Bernd Schmeck from Philipps-University Marburg as substitute Executive Board member. Prof Dr Schmeck is a physician by training and currently head of the Systems Biology Platform of the German Center for Lung Research in Marburg. He is responsible for Systems Medicine Training of both medical students and master students for human biology at Philipps University Marburg. Prof Dr Schmeck is a founding member of EASyM and was one of the eleven Executive Board member candidates at the initial Executive Board election at the EASyM founding meeting. At that stage he had already shown an interest in the position of the EASyM Treasurer. For EASyM’s General Assembly in 2016, he acted as financial auditor. Prof Dr Mikael Benson’s position was filled by Dr Pablo Villoslada. Dr Villoslada is a clinician and director at IDIBAPS, Hospital Clinic of Barcelona, Spain, with a main focus on systems medicine of Multiple Sclerosis in ongoing projects such as Sys4MS and MultipleMS. The Executive Board welcomes both Prof Dr Schmeck and Dr Villoslada as new members of the board.